Administrators of Dossier Institution accounts can establish "Guidelines" to help Dossier users at their institution prepare for upcoming reviews. Guidelines are automatically created when you add candidate instructions, packet requirements, and form requirements to a template. When completing the template, you are given the option to make these requirements visible to Dossier users as guidelines. Each individual Dossier user at your school can then view, search for, and save the institutional guidelines you establish for a particular academic review process from within their Dossier. When preparing for a review using the guidelines feature, users can automatically assemble collections of materials that meet the requirements of the review. When the time comes for the actual review, users can easily transfer the materials from the collection over to the official review packet. 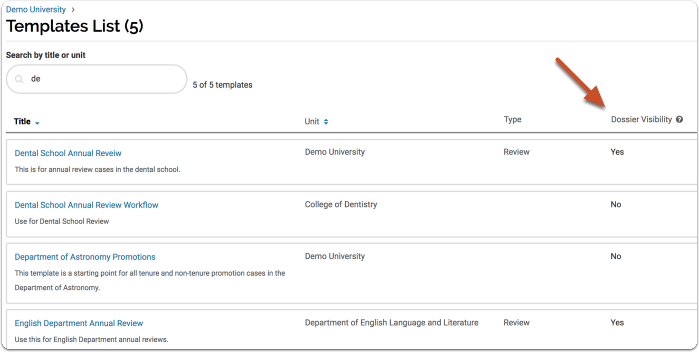 For more information on this workflow, see the article "Use Guidelines From Your Institution to Prepare for Reviews." This article explains how to set up guidelines for your users to reference when creating reviews. 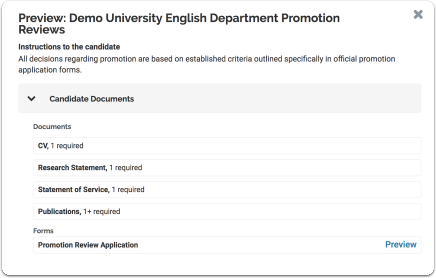 Guidelines are automatically created when you add candidate instructions, packet requirements, and form requirements to a template. You can disable Dossier visibility from the same location. Templates with visible guidelines are marked in the template list under "Dossier Visibility"